Today is another historical day for Microsoft, as tech giant is going to release its major products including Windows 10 Final. At the Build 2015 developer conference , Microsoft have started with the event with the new release announcements. The first thing Microsoft announced is a cross-platform version of .NET, the company’s software framework that primarily runs on Windows. The company has released a preview of the .NET Core runtime distribution for Mac and Linux. .NET Core allows developers on platforms that aren't Windows based to build their applications using the language for the first time. Microsoft also announced the availability of the full .NET Framework 4.6 RC and the .NET Core 5 Beta 4. Yet the bigger story is that Microsoft is finally delivering on its vision to let developers build cloud applications on multiple platforms using .NET. While .NET Core OS X and Linux is implemented and supported by Microsoft, it is developed under an open source license. The company previously made available a technical description of what you can do with .NET core and how it fits into the platform. Apart from this, company have made another surprising announcement. 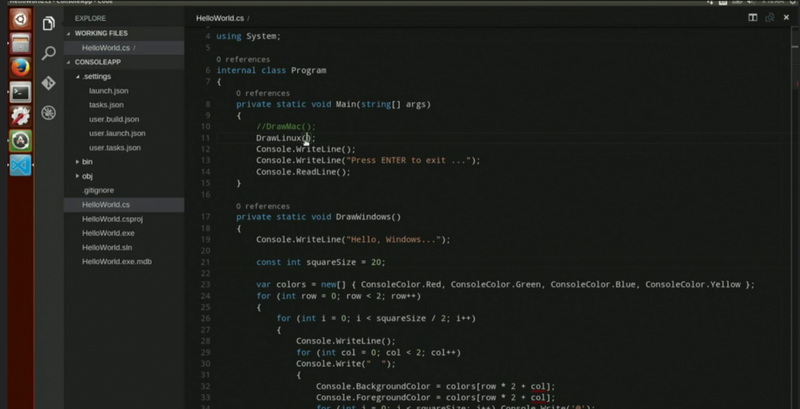 Microsoft unveiled its first version of Visual Studio for Mac and Linux. This release from the tech giant makes the developer work more easier, as it makes easy to develop .NET code along with many other programming languages on Linux based systems. Visual Studio Code is available for free, beginning today and you’ll be able to download it here when it goes live.